The Yolo Bypass in March 2006, looking east from Davis toward Sacramento. Heavy rainstorms in January led to total flooding in the bypass. Flooded Yolo Bypass, February 2006. Interstate 80 runs along the causeway in the distance. 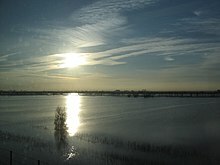 The Yolo Bypass is one of two flood bypasses in California's Sacramento Valley located in Yolo and Solano Counties. 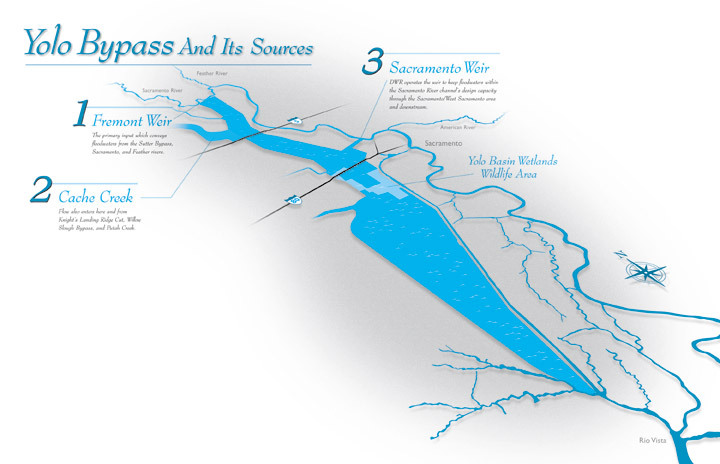 Through a system of weirs, the bypass diverts floodwaters from the Sacramento River away from the state's capital city of Sacramento and other nearby riverside communities. Sacramento experienced several severe floods prior to construction of the bypass. During wet years, the bypass can be full of water. The main input to the bypass is through the passive Fremont Weir, where water spills over into the bypass if it reaches the 33.5 feet (10.2 m) crest. Downstream, the Sacramento Weir, just north of the city of West Sacramento, can also be opened to divert additional waters if needed. The bypass ends a few kilometres north of Rio Vista in the Liberty Farms area, where the bypass joins first Prospect Slough and then Cache Slough adjacent to the connection of the Sacramento Deep Water Ship Channel. Cache Slough then reconnects with the Sacramento River just north of Rio Vista. 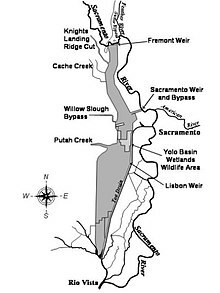 The Yolo Bypass contains the Fremont Weir Wildlife Area, Sacramento Weir Wildlife Area and Yolo Bypass Wildlife Area. Vic Fazio Yolo Wildlife Area is part of the Yolo Bypass Wildlife Area and was the largest public/private restoration project west of the Florida Everglades. The entire bypass forms a valuable wetland habitat when flooded during the winter and spring rainy season. In the summer, areas of the bypass outside the wildlife areas are used for agriculture. The bypass is crossed by the Yolo Causeway, a long highway bridge on Interstate 80, linking West Sacramento west to the city of Davis. To the north, Interstate 5 also crosses the bypass on the Elkhorn Causeway, east of the city of Woodland. The California Department of Water Resources's schematic map of the Yolo Bypass, 2009. During the 1800s, the Yolo Basin would fill up in the winter months from three surrounding rivers' water. This created a diverse marsh ecosystem that could last more than 100 days. This resulted in limited travel and access between cities. The Congress approved the Sacramento River Flood Control Project in 1911, with a plan to divert the water through multiple weirs and bypasses. The Yolo Bypass is one of two major bypasses in the Sacramento Valley that helps deter urban flooding. The 59,000 acres (24,000 ha) floodplain was designed in the early 1930s as part of the Sacramento Flood Control Project by the US Army Corps of Engineers. It lies just in between Yolo and Solano Counties. The Yolo Basin extends almost 40 miles (64 km) long and 3 miles (4.8 km) wide. Almost 75% of the Yolo Bypass is privately owned, while the rest belongs to the Yolo Bypass Wildlife Area. Most of the land is used for agriculture during the summer and spring, and the rest makes up marshland. This marshland is ideal for animal habitat, and is also utilized for fishing, hunting, and other recreational activities. The Yolo Bypass provides habitat for over 280 terrestrial vertebrate species, changing throughout the seasons. The natural flooding provides an exceptionally good nursery habitat for native fish species, including the endangered Chinook salmon. Juvenile salmon have been found to grow substantially better in the Yolo Bypass than the adjacent Sacramento River. Other special-status wildlife residing in the Yolo Bypass includes giant garter snake, fairy shrimp, bald eagle, Swainson's Hawk, and more. Wildlife managers occasionally flood certain areas to create wetlands for migratory waterfowl. The Yolo Bypass is somewhat of a pit stop for the waterfowl, and it provides nesting habitat and food for this abundance of birds. The Yolo Basin Wetlands Project is accounted as being one of the largest wetland restoration projects in the Western United States. Habitats in the Yolo Basin Wetlands includes seasonal wetlands, uplands, perennial wetlands, vernal pools and riparian forest. The Bypass also holds species of riparian vegetation such as cottonwoods, black walnut, willows, saltgrass, and other assorted tree and grass species. Habitat Management activities are monitored annually by the California Department of Fish and Wildlife's Wildlife Area Habitat Committee for area in the Yolo Bypass Wildlife Area. Each year they establish a specific management plan for different parts of the land. The targeted species for seasonal wetland management is the timothy species. This plant provides countless nutritional seeds for consumption by assorted migratory waterfowl. There are also quite a few nonnative species that are not necessarily wanted in the bypass such as dock and perennial pepperweed. Years with high flows in the Yolo Bypass also benefit fish populations in the San Francisco Estuary. This is mainly because of increased habitat availability, food supply, larval transport, and reduced predation. The floodplains of the Yolo Bypass are a surprisingly good farming ground for multiple seasonal crops. The California Department of Fish and Wildlife leases out land to farmers through the Dixon Resource Conservation District. The main widely grown crops are: rice, safflower, processing tomatoes, corn, sunflower, and irrigated pasture. Half of the rice grown in the Yolo Bypass is wild due to its tolerance to colder weather. Farming is mainly done in late spring and summer when flooding does not usually occur, but farming can be halted or pushed back depending on the water level in the Bypass. Agricultural crops from Yolo County amount to about $300 million a year. Most of leftover crop residue is actually beneficial to animal habitat as well. The already harvested land creates foraging area, and food opportunities, such as seeds for ring-necked pheasants and mourning dove. Flood control is the main purpose of the Yolo Bypass. When there is too much water flowing into the Sacramento River, it is released into the Yolo Bypass at the Fremont Weir. The levee at the weir is about 33.5 feet (10.2 m) tall, nearly 12 feet (3.7 m) shorter than that on either side. When the water reaches the 12 feet (3.7 m) mark it starts to flow out into the Yolo Basin. As water recedes, the basin is drained through the Toe Drain, a riparian channel located on the east side of the bypass. The water will eventually drain out into the Sacramento-San Joaquin Delta just above Rio Vista. 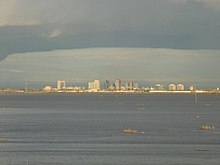 The Yolo Bypass can hold approximately four times the flow of the Sacramento River. This flood management relieves pressure on the surrounding river levee systems and reduces the risk of urban flooding in nearby cities, such as Sacramento or Davis. The state of California has the right to inundate any land in the Yolo Bypass with floodwater. These rights also limit landowners from growing vegetation or building structures that would significantly obstruct flow. There is no compensation for farmers who may lose crops or other losses due to flooding. The state manages the flooding of the Yolo Bypass with farmers and native species in mind. Using adaptive management, there is a balance between providing efficient flood protection, agriculture, and habitat benefits in the Yolo Bypass year-round. The Nigiri Project is a collaborative research study being done in the Yolo Bypass at Knaggs Ranch by the UC Davis Center for Watershed Sciences, the California Department of Water Resources, and the nonprofit organization California Trout. This research is essentially looking to find out how floodplains, particularly flooded rice fields, can provide habitat to endangered species such as the Chinook Salmon. In the summer these fields are used for the production of rice, while in the winter, the land can be flooded to create ideal wetland habitat for salmon. They have been experimenting for the past 4 consecutive winters, and have documented the fastest growth of Juvenile Chinook Salmon ever recorded in the Central Valley. The experiment aims to mimic the natural annual flood cycle of the Sacramento River, which most native fish species relied upon. This project is currently funded by the U.S. Bureau of Reclamation, California Trout, and the California Department of Water Resources. The Yolo Bypass provides a multitude of recreational uses and educational as well. The Yolo Bypass Wildlife Headquarters provides summer educational programs for children in kindergarten through high school. These programs include hands on activities on plants, animals, and wetlands, using the Yolo Bypass Wildlife Area as a classroom. They have summer camps, classes, and are open to schools wanting to coordinate field trips as well. The Bypass is also open for guided tours for all ages of the public every month. The Yolo Bypass is often used for bird watching, hunting, and hiking. Game species include waterfowl (when the bypass is flooded), ring-necked pheasant, and mourning dove. There are also assorted trails that loop around the wetlands in the Yolo Bypass that may be accessed by the public. Recent modeling shows that increasing flow to the Yolo Bypass may be beneficial for animal habitat. An upcoming project looks to extend the Yolo Bypass by potentially pushing back the levees, and allowing more room for water to be released into the Yolo Bypass. Separately, the Bay Delta Conservation Plan includes plans to help restore fish habitat in the Yolo Bypass. Its plan is to put a notch at the top the Fremont Weir to allow for more water to flow, increasing the frequency of flooding for fish habitat. ^ "A Framework for the Future: Yolo Bypass Management Strategy" (PDF). Yolo Bypass Working Group, Yolo Basin Foundation, and Jones & Stokes. August 2001. Retrieved June 28, 2018. ^ Tokita, Joyce; Cameron-Harley, Jamie. "Beneath the Flood". California Department of Water Resources. Retrieved 2009-02-28. ^ "Managing for Multiple Benefits: Farming, Flood Protection, and Habitat Restoration in the Yolo Bypass Wildlife Area" (PDF). February 21, 2013. Retrieved June 28, 2018. ^ Cloé Garnache and Richard E. Howitt. "Species Conservation on a Working Landscape: The Joint Production of Wildlife and Crops in the Yolo Bypass Floodplain" (PDF). University of California, Davis. Retrieved June 28, 2018. ^ "Building Rivers: The Yolo Bypass - Hiding in Plain Sight". NRDC. September 23, 2011. Retrieved June 28, 2018. ^ Biological Resources Retrieved June 28, 2018. ^ "Our third river". Sacramento News & Review. ^ "FLloodplains: Lessons from the Cosumes River and Yolo Bypass". Delta Council. Retrieved June 28, 2018. ^ The Nigiri Project Retrieved June 28, 2018. ^ "Nigiri Project Mixes Salmon and Rice Fields for Fifth Year on Floodplain". ucdavis.edu. University of California, Davis. February 23, 2016. Retrieved June 28, 2018. 1. Christian-Smith, Juliet. "Managing Fo Multiple Benefits: Farming, Flood Protection, and Habitat Restoration in the Yolo Bypass Wildlife Area." Pacific Institute: 1-9. Web. 23 Apr. 2016. 2. "About the Yolo Bypass Wildlife Area - Yolo Basin Foundation." Yolo Basin Foundation. Web. 23 Apr. 2016. 4. Garnache, Cloe, and Richard E. Howitt. "Species Conservation on a Working Landscape: The Joint Production of Wildlife and Crops in the Yolo Bypass Floodplain." (2011): 1-39. Department of Agricultural and Resource Economics. Web. 23 Apr. 2016. 5. Kiparsky, Michael. "Floodplains: Lessons from the Cosumnes River and Yolo Bypass." (2003): 1-4. California Bay-Delta Authority. Web. 23 Apr. 2016.